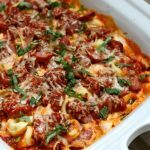 Slow Cooker (or Oven) Tortellini Lasagna Casserole with Sausage—Simple to make but you wouldn’t know it! 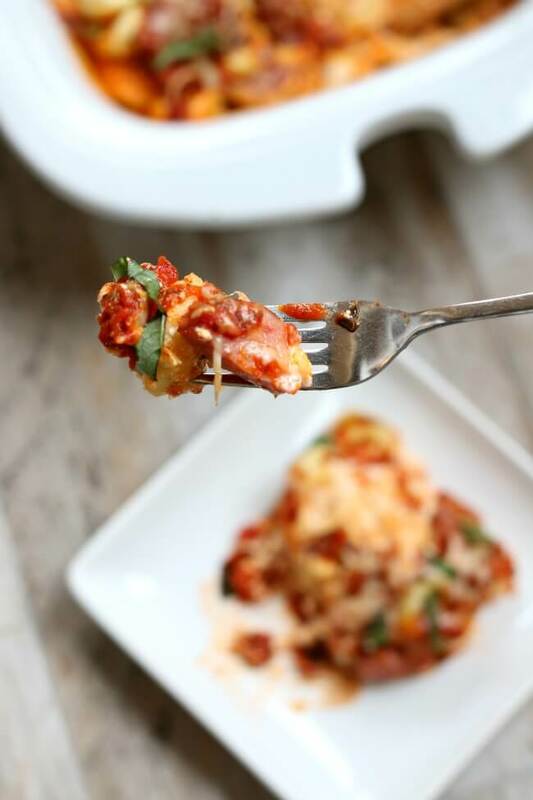 This easy dinner recipe for tortellini lasagna with smoked sausage has all your favorite flavors but doesn’t require browning meat or cooking noodles before putting it together. The added bonus is that you can cook it in the oven or the slow cooker–it’s up to you! Have spring sports started at your house? We are starting a new sport this week…baseball. My son has done football, soccer, wrestling and my daughter has done dance and drama and basketball but we haven’t tried baseball yet. He’s so extremely excited. He’s constantly walking around with a mitt on his hand and a baseball in the other. If he had it his way he’d play sports all day every day. 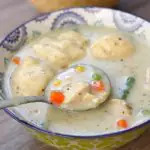 With all the spring sports and activities going on at my house–and I’m sure at yours too–let’s make dinner easy on ourselves. (Even when I don’t have a lot going on I like to make dinner easy on myself–lol. 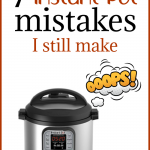 That’s why I write crockpot recipes). One way to do that is by hitting your local Kroger (we have Smith’s here) and stocking up on Hillshire Farm Smoked Sausage. 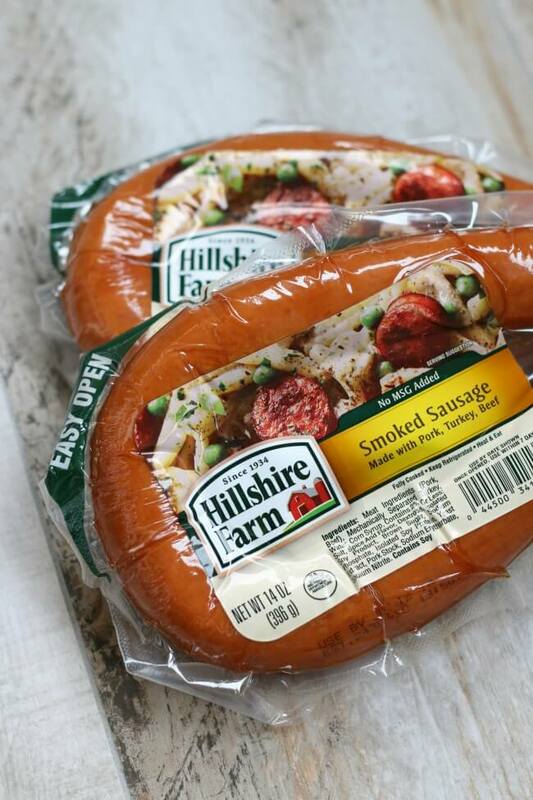 From now until April 19th, Hillshire Farm sausages ares only 2 for $5 (while supplies last). You can easily find the sausage in the refrigerated section on the perimeter of the store. I picked up smoked sausage but there were other types too (like Chicken Basil Pesto and Kielbasa). If you’d like to check the sales before you head to the store you can easily go to Kroger’s website and type in your zip code to find what’s on sale at your local store. 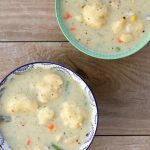 For this recipe you’ll start with a bag of frozen tortellini in the bottom of your slow cooker (or pan). 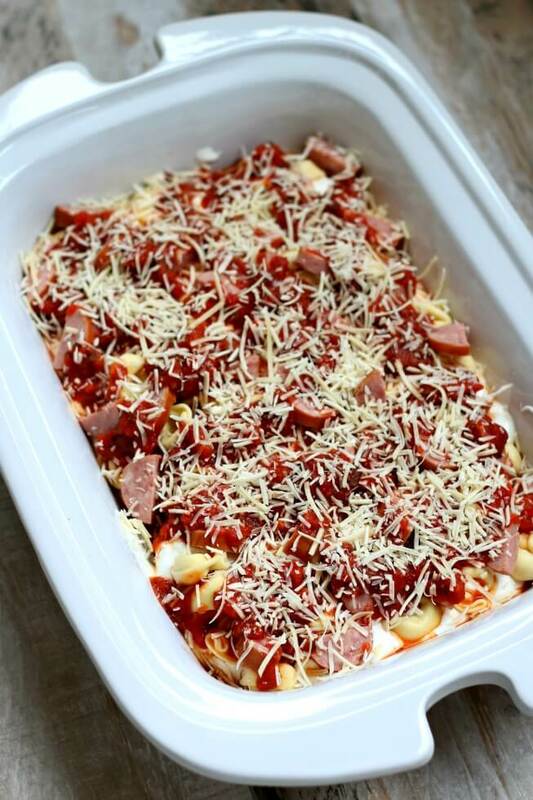 Then you’ll layer spaghetti sauce, a cream cheese/cottage cheese/sour cream mixture and sliced Hillshire Farm Smoked Sausage. 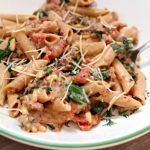 Finally you’ll top with a bit of Parmesan cheese and fresh basil and then cook it. Told you it was easy!! 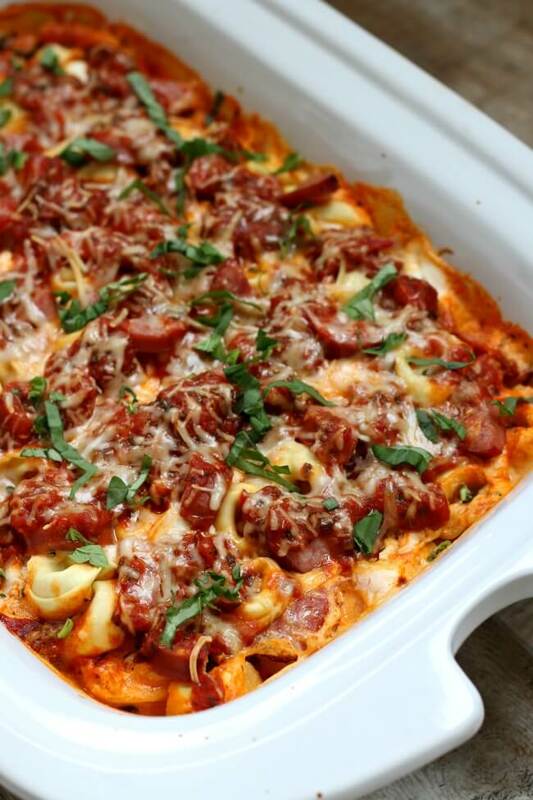 For more easy dinner ideas with sausage visit Hillshire Farm’s recipe page. I’m most excited about making the smoked sausage fried rice and the cheesy potatoes with smoked sausage. 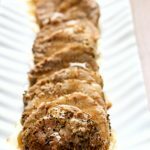 And if you’re interested here are all my slow cooker sausage recipes. Simple to make but you wouldn’t know it! 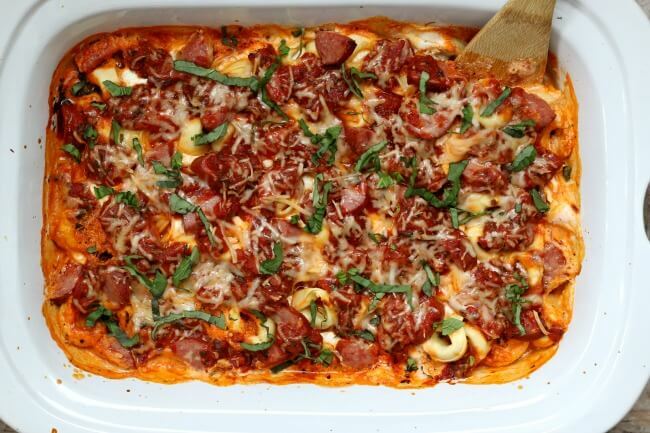 This easy dinner recipe for tortellini lasagna with smoked sausage has all your favorite flavors but doesn’t require browning meat or cooking noodles before putting it together. The added bonus is that you can cook it in the oven or the slow cooker–it’s up to you! Combine cream cheese, cottage cheese and sour cream in a blender. Blend until smooth. In the bottom of your slow cooker or 9 x 13 inch pan (if you’re baking in the oven), pour in half the package of tortellini. Layer half the sausage, half the sauce, all the cream cheese mixture, the rest of the tortellini, the rest of the sausage and the rest of the sauce. If baking in the oven, cover the pan with foil and bake for 45 minutes at 350° and then remove the foil and bake for an additional 15 minutes. 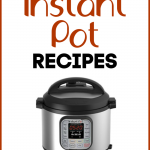 If cooking in the slow cooker* cover and cook on HIGH for 3-4 hours or on LOW for 5-6 hours. *I used my 3 quart casserole crock but if you don’t have a casserole crock you can use a 4-6 quart oval slow cooker. I’ve never baked noodles without baking them first. If they’re not oven ready tortellini noodles, will they still bake in the oven/crockpot? Made this tonight and it was pretty yum. It pretty much tasted like a lasagna. I did it in a crock pot on low for about 6 hours and it was perfect. This makes plenty for 6 adults if not more. We had 2 big eaters and 2 avg eaters and we went through a little more than half of it.